Looking for things to do in Palmerston North? Palmerston North has a long history of hosting and entertaining visitors from around the world. The central business district is centred on a large leafy square and many of the historic buildings have been restored and are now charming boutiques, cafes and restaurants. Attractions include the highly acclaimed Te Manawa science centre, museums and galleries, the beautifully restored Regent Theatre, and the New Zealand Rugby Museum. Read below for more thngs to do in Palmerston North. Fans of the oval ball holler about the New Zealand Rugby Museum, an amazing space overflowing with rugby paraphernalia, from a 1905 All Blacks jumper to a scrum machine and the actual whistle used to start the first game of every Rugby World Cup. Of course, NZ won back-to-back Rugby World Cups in 2011 and 2015: quiz the staff about the All Blacks' 2019 prospects. Te Apiti - Manawatu Gorge is a magnificent geographical structure formed over thousands of years by the Manawatu River. With its native bush and wildlife, Te Apiti is a time capsule that preserves the bush that once covered Manawatu, a place frozen in time. At the cultural heart of Palmerston North, Te Manawa draws art, science and history together, recognising the uniqueness of each area and reflecting the growing region and its people. Looking for more things to do in Palmerston North? Try looking at Tripadvisor, Lonely Planet, or read more in the "Discover" section of our site. 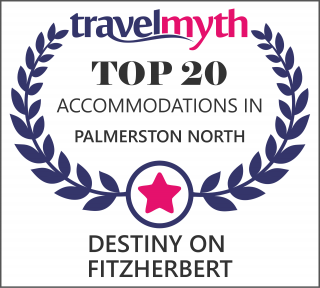 Looking for Palmerston North Accommodation? We'd love to host you here in Palmerston - check out our great selection of rooms today.